If you’re an avid user of the social networking communities, then you’re probably aware of the ‘No Make-Up Selfie‘ craze that has swept the online nation. If not, I’ll give you a little brief to bring you up to speed. People from across the world have been taking ‘selfies’ (look it up if you don’t know what one is – it’s in the dictionary now) without any make up on, claiming it was for charity. At first, it was absolutely pointless and I had no idea what the relation was to cancer. That was, until some clever bean decided to add the text code for Cancer Research UK into the caption of their selfie and tagging their friends to do so, too. Although this had nothing to do with the charity, the craze ended up raising over £2 million. Since then, lots of charities have seen this as a great marketing tool to help raise money – create an online trend and link it to a donation text number. This brings me to the point in this article. Spectacle Theatre Ltd. have been running since 1979 and is a registered charity which uses theatre to empower individuals, groups and communities as well as working with hard to reach and vulnerable people through productions, training and workshops. Spectacle are now asking you to help take part and set a new trend. Its name? #SpectacleSpecs. It’s simple, really. All you have to do is take a selfie with you wearing funny glasses (the crazier, the better!). Then make a small donation by texting SPCT12 + Your donation to 70070. Upload your photo to Twitter or Facebook using the hashtag #SpectacleSpecs and then tag your friends to nominate them. Told you it was easy! â€¢	Nominate people to do the same! With your donations, Spectacle can continue to deliver workshops and work with vulnerable and hard to reach people. 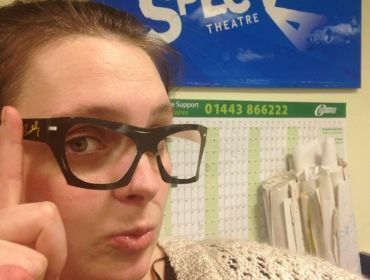 Don’t forget to share your selfies with Spectacle on their Facebook (https://www.facebook.com/pages/Theatr-Spectacle-Theatre/393368894047288?fref=ts) or on Twitter @SpectacleTheat1 and some of the #SpectacleSpecs will be shared! Related Article: Armpits4August – Will You Go Hairy For Charity?